There are some great bigger publishers in the RPG industry but also there are many wonderful small one-man-show-publishers (yes, it's more men than women but we have more men than women in this industry, right?). My favorite "indie" publisher is Paolo Greco/Lost Pages. It's a small firm located in the UK. Paolo concentrates on old school role-playing but isn't content to re-hash what's been done before but creates new things. He wrote Adventure Fantasy Game, a simple game which only uses 1d6 and has a unique task mechanism. 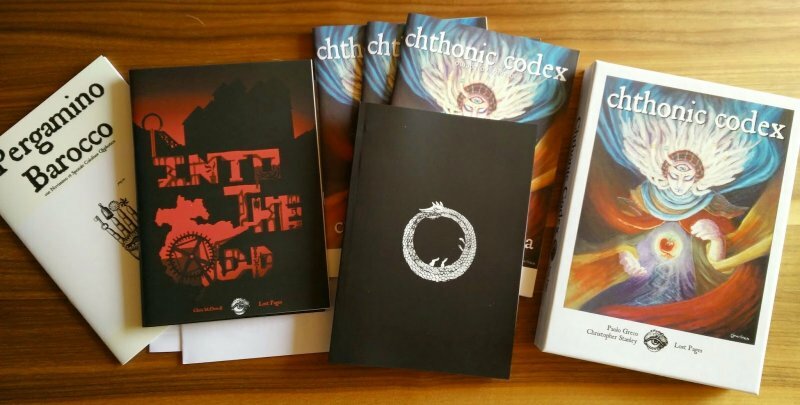 Also, Cthonic Codex, a setting book for AFG (here is a great review by Oliof). You can also get this as a boxed set or a coptic bound hardcover. And more. Furthermore, he lately pulled in other excellent writers: Chris McDowall, who wrote Into the Odd, an OSR horror-survival game with a unique theme and a great ruleset, and Brendan Strejcek's Wonder & Wickedness, a new magic supplement. So, if you're looking for fresh ways of looking at old school role-playing you should definitely check it out. Paolo is also very responsive on G+ and via email and all my packages have arrived without problems neatly packed.